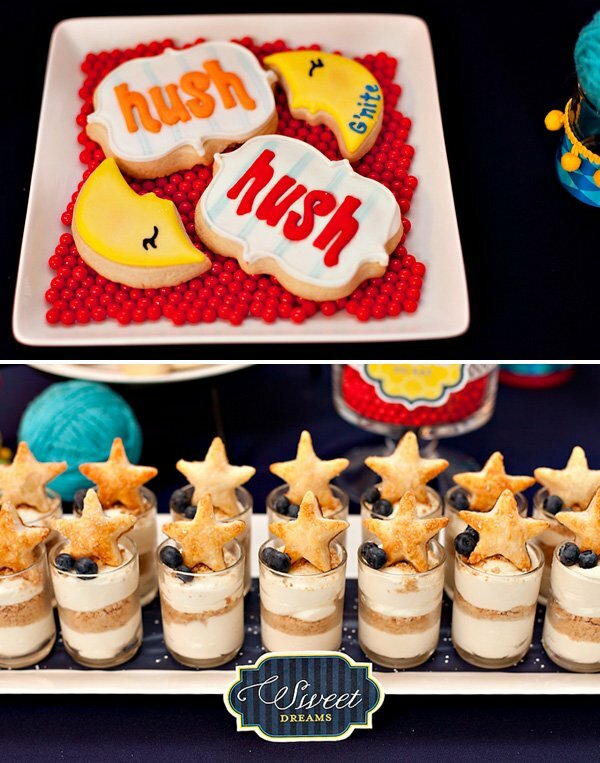 In continuing with our new Goodnight Moon Inspired Baby Shower, here we go with PART 2: The Dessert Table! As with Part 1, there are tons of free party printables for you to download here too in case you want to recreate this theme at home. mini cupcake toppers, food/drink flags, decorative labels (used on the candy jars & plates), “GOODNIGHT” garland, and small decorative banners, and hanging stars and ribbon banner from the backdrop. You can also purchase the big jumping cow & moon graphics here. Part 2 also comes with an ADDED BONUS though – a SURPRISE GIVEAWAY, courtesy of Glue Dots! (I used these handy little adhesives extensively to bring this theme to life.) 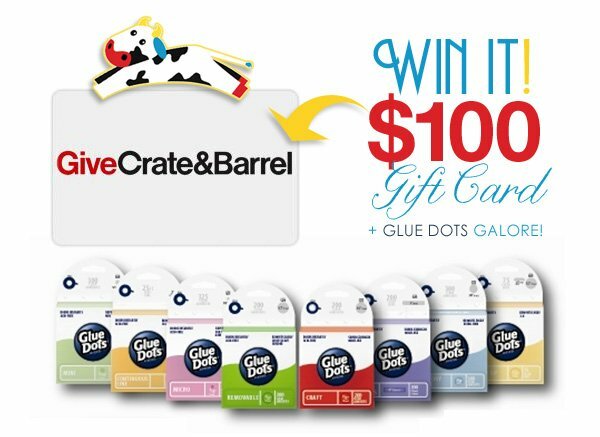 They’re offering up a $100 GIFT CARD to Crate&Barrel, in addition to lots of Glue Dots product & a branded apron… FUN! Entering is easy – see details at the very bottom of this post. The striped table backdrop is actually a shower curtain from Target! A navy blue linen worked well with the “night time” theme and provided a nice foundation for the table that really made the bright colors pop. I used fishing wire to hang a “cow jumping over the moon” backdrop over the shower curtain. The adorable cow and moon illustrations are by Laura Maples and you can purchase the art file right here at istockphoto.com. Just print and cut them out by hand – you can print as many as you need for the party! Click on the following links to download the coordinating Stars and Ribbon Banner for free. Colorful candy & lollipops were displayed in various apothecary jars and vases. The containers were all embellished with themed accent labels and the same ribbon used throughout the sit-down tables & hutch. You can download the decorative labels right here. Yarn balls (also an element the book) were again used as accents throughout the table and really tied everything together. DIY tutorial on the yarn balls coming soon! Mini vanilla cupcakes (purchased at Vons – my local grocery store) were displayed on a cute display stand from The Cupcake Tower. I used Craft Glue Dots to edge the display with matching ribbon & accent labels and designed miniature toppers for the cupcakes. You can download the toppers right here. The top of the cake stand was the perfect place to highlight the theme’s inspiration, so a copy of Goodnight Moon + some yarn balls and crochet needles sat here. Golden and regular Oreo cookies were dunked in red and yellow Candy Melts for another easy (and seriously super yummy!) homemade treat. I also made 2 “faux lamps” (also inspired by the book) using pillar candlestick holders, inexpensive lamp shades from IKEA, and a strand of acrylic beads for the “pull cord”. Craft Glue Dots were used to embellish the lamp shades with ribbon & pom pom trim. DIY tutorial coming soon. Last but not least, the front of the table is adorned with a GOODNIGHT garland featuring individual letters attached to ribbon for hanging. (Download this garland here.) I also stuck one of the paper ribbon banners to the middle of the finished garland for some added detail. I loved how the cows were incorporated into the theme! My daugther is head over heals with cows! I love it all, but I love how simple the oreos were, yet they add such a cute flare and color to the table. WOW!! What a creative and gorgeous shower Jen!!! Love all the desserts!!! That shower curtain is awesome!! I wonder how many other gals out there would use a shower curtain as a backdrop..lol AMAZING work as always!! LOVE IT! I would get more baking supplies! I’m a newbie baker trying to start a little home based business, so the gift card would be great!!! I also love the cake toppers but don’t know how to download them. Help, anyone? I love the cookies and the color scheme of this, and I LOVE CB! They started carrying Weck canning jars recently and I can easily see myself spending $100 on just those. Great giveaway! I love the banner and how perfectly it matches the Goodnight Moon colors! I would love to win that gift cert. Everything looks so cute. I love the sweet dreams desserts in the shot glasses! I love the yarn balls and the lamps. Such great elements to incorporate from the book! I would use the GC to buy more entertaining items, as I have become addicted to planning parties/get-togethers since finding your website! And I have to say, glue dots are amazing! They are very strong considering how convienient and small they are! I really like all the cow details! And how the cookies almost exactly match the decorations. I’d put the crate & barrel gift card towards stocking up on serving platters and dishes! OMG how adorable is this?!? I love it! Great job Jenn! I love the balls of yarn! Such a sweet and perfect touch. And thanks for the reminder to check out Crate and Barrel’s website. I’m seriously eyeing all thinks Marimekko. I LOVED this party post! I loved reading this book to my children when they were young and this party really evoked the vivid colors and sweet sentiments of the book. I loved seeing the diamond ribbon in unexpected places. I loved the cookies. I love the balls of yarn and crochet hooks. I thought the whole thing was brilliant! Thank you! I love the dipped oreos! This is such a great idea that is so simple and could be used to add some color to any party! I love this idea! The colors are so great and are right along with the book. The yarn and cow accents are nice touches. This is such a whimsical, beautiful display, sure to delight many just like the book. The sugar cookeis are gorgeous and I love the dipped oreos and the star dessert. I would use the gift card to buy pieces for entertaining. You’re site always inspires me to want to do more parties! I love all the little details! A big fan of the cupcake toppers and labels on the jars! The giftcard would go to anything and everything party planning! It is my weakness. I love little DIY details at parties (handmade place cards, home-baked takeaway treats, etc). Love the cookies and yarn decorations. I love the Hush cookies. That’s my nephew’s favorite part of the book! Perfect. I love this party. Your website is so inspiring. Both my son & I love the “Goodnight Moon” story… this shower theme looks so great. I would use the C&B gift cert towards more supplies. I love the use of yarn, especially on the forks! I’d get more serving wear– so I can create beautiful tables like this too! What a wonderful theme! I would use the gift card towards out Master Bedroom. It was the last room to be done but we never end up having enough money so it keeps getting put off. I’d use the gift card to buy housewares from Crate and Barel. Love their stuff!! I would use the Crate & Barrel gift card towards serving plates to use in my daughter’s upcoming birthday party :o) I LOVE LOVE LOVE this theme! So beautifully done. I would use the crate and barrel gift card to find some cute stands and glasses that you always use for your parties. I could think of a million uses for the glue dots!!!! I love the cows, they are absolutely adorable. The color pallett is beautiful as well. Thanks for sharing. my favorite detail would definitely be the cookies – so detailed and done perfectly (coming from a 7 mo. preggo) ha ha. I do have an upcoming Halloween Party and would love to put the gift card to use purchasing a few Halloween related items. Love the dessert table. So cute! To make your baby shower even more memorable, go order your invitations at http://www.acsgreetings.org with Americacn Cancer Society. While celebrating the birth of your baby, you can support to help create a world with more birthdays and less cancer. Goodnight Moon – a tradition at our house. I would use the Crate and Barrel gift card towards Christmas gifts! I love the way the guest tables looks like a bed. 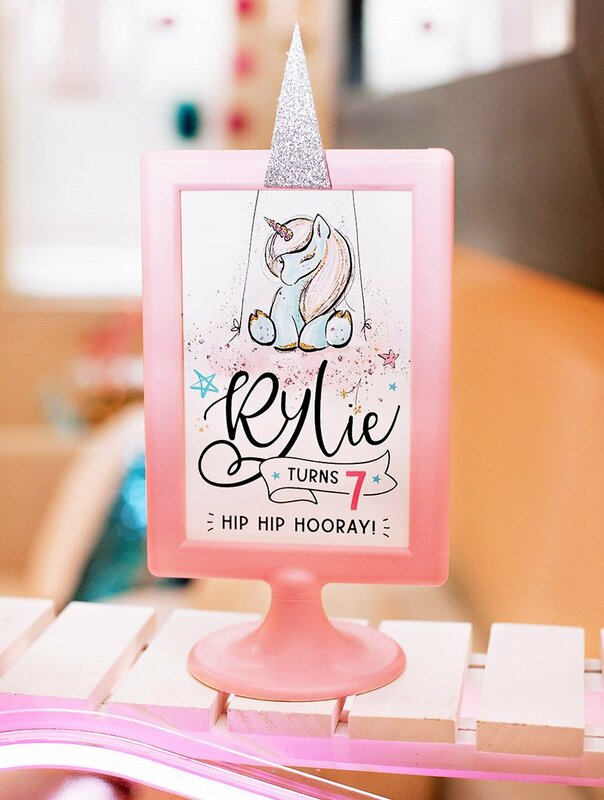 I love the tea cups and printables. I also love how you use a shower curtain as the tablecloth. I love dipping the oreos in the colored candy melts! Too cute!! I love it ALL! But if I had to choose one thing I think it would be the balls of yarn throughout, such a cute touch to add color and if you’ve ever read the book you understand the meaning. My 2 year old LOVES when I read this to him, and reading it to me! Great Job! Crate & Barrel has such amazing stuff for the home – especially for entertaining. My favorite so far is the bubble ball tealight holders but with inspiration like this shower, I’d probably go for something like the iron dish holder or more platters/serving pieces. What amazing ideas you have!!! My daughter is about to move back home after living on her own for 4 years. She’s bringing her 2 1/2 -yr daughter with her. A gift card would help make her old room a place for both of them to enjoy. So adorable and I really like the colors. One of my favorite books to read to my kids. Thanks for the lovely post. I love the yarn balls, so colorful! I would love a gift card to decorate the new house we just bought. Crate & Barrel has some beautiful serving platters and pitchers that I would love to own! I love the dipped Oreos. I just came across your blog and love, love, LOVE it! This is so cute, as is all your wonderful dessert table ideas! I specifically like how you have your basic accessories for each table and change the ribbon, cards, and colors for each theme. It gave me great ideas for a baby party I’m going to throw for my daughter in a couple of months. I love the yarn balls everywhere! Especially on the back of the chairs! And I’d definitely buy baking supplies at CB!!! Or a cookbook! I love all the bright colors in the the theme and the yarn balls and lamp. I would use the gift certificate to stock up on serving platters and maybe some fun halloween decorations! 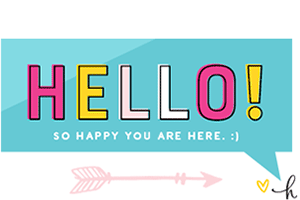 This is the cutest theme – love all the bright colors! My fave are the cheesecake shooters! But I love the overall colorful/but not super bright mood! Well I’d have to use the Crate&Barrel gift certificate towards Staccato Dinnerware set! I’m getting married next year and I’m going to need some cute dishes to host with! The cow jumping over the moon is one of my fav. This is one of my favorite books growing up! I loved all the yarn details. 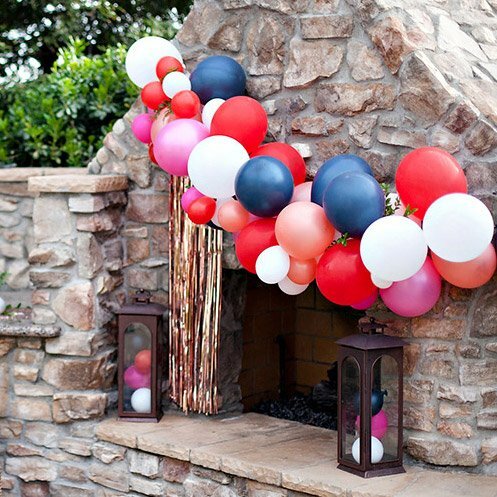 Using the yard balls to decorate adds such a fun and playful look to the whole party! I love the color scheme. Bright! Vibrant! I would use a Crate & Barrel gift card towards some new cake plates – desperately need them! Thank you! I LOVE the cow cookies…so cute! I LOVE the balls of yarn and the alternating half dipped oreos!!!! I love the dessert shooters with the stars. This is one of my daughter’s favorite books – fantastic for them to do such a nice modern theme with it! I would use the C&B card to buy some new serving dishes! I need more platters and trays! 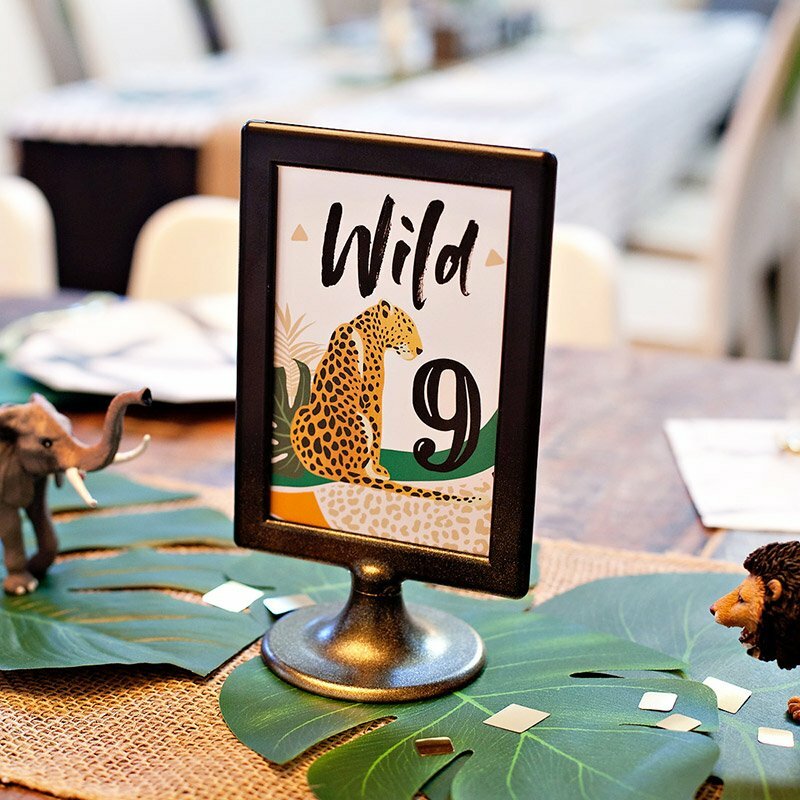 I love love love your ideas for this baby shower! The ‘table beds’ were a super creative idea! It was all wonderful. As for the C&B gift card….I am slowly but surely putting together a ‘fun’ room at our house for our preschool age grandchildren…I am sure there are things I could use to complete this makeover! I love the “Goodnight Moon” theme and that the tables where clothed as beds, with sheets and a pillow. It added to the overall look and appeal. I also love all the over the moon cow decor. 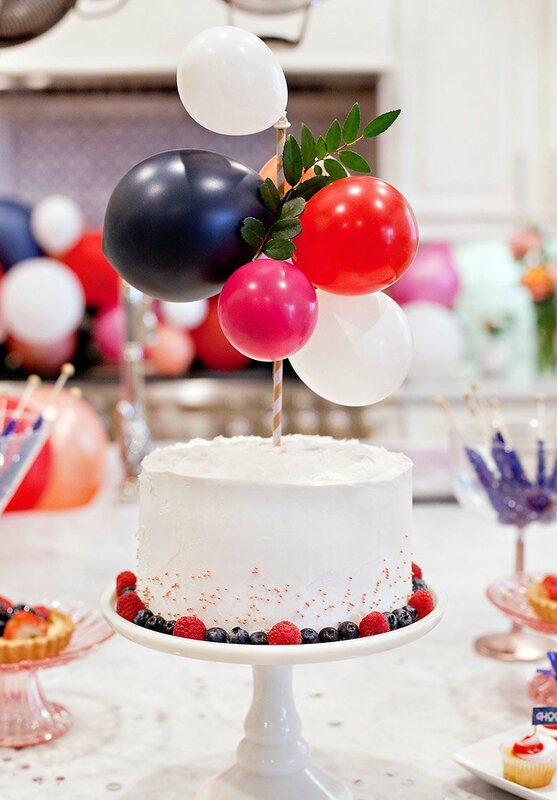 Simply cute for a little one’s celebration. I look at this and can only imagine all the fun events that I can host for family and friends and would use the Crate&Barrel gift certificate to build up my supplies to bring an event to life! I LOVE the dipped oreos! They incorporate the colors beautifully. I will use that idea for a bridal shower I am throwing! Love the specialized sugar cookies and, even though its nothing new and I’ve done it several times myself, I always love printables and labels on things like cups and water bottles! With the holidays coming up you know I would be in C&B checking out their new holiday items! I really like the cheesecake shots with the star garnish, and the yarn ball lollipops. I LOVE Crate & Barrel! We purchased a nice dish set from there a while ago, but now we want to go back and get the matching bowls…a gift card would be perfect! The oreos are so simple yet so adorable and I love that. I also like the pastry topped Cheesecake Shooters. Such a cute idea. As for the CB giftcard I’d use that to get some items for my kitchen and master bedroom. Those are the only two rooms left to do in my house. My favorite element is actually the little yarn ball on top of the shooter glass embellished with ribbon and fringe. So simple but so clever! As awesome as a C&B gift card would be, I honestly want all the glue dots – they make throwing a party so much easier for the non-sewer-don’t own a glue-gunner’s out there, not to mention much more green cause you can reuse your elements over and over. Beautiful shower! I would use the crate and barrel gift card to spruce up our house with fall decor! The crate and barrel gift card could really help spruce up my master bedroom. It is in serious need of an update! I absolutely love this theme (and the book), but my favorite thing has to be the recurring jumping cow! I just ADORE the yarn balls, especially the “lollipop” ones. They really do bring everything and the whole color scheme together. Also, those cookies are amazing! I could definitely use some new kitchenware from C&B. I love the textures and color scheme! So cute! I would love to get some new C&B accessories for my house!! I love the lamps! So cute! I love the yarn balls. Adorable, can’t wait for the tutorial! I love the cheesecake shooters and the lamps to look like the book. Genius! I love everything. But I really like all of the colors! Simply gorgeous! I love the colorful cake displays. I’d buy my sister’s wedding present with the gift card. I love the little cheesecake shooters. They look so yummy and I like that the little star garnish ties them in with the theme. Goodnight Moon is one of my favorite books! I love the cookies with the cows, stars and moons! I would put a Crate & Barrel gift cards towards getting some simple white platters – love how these look! I have had my eye on the Sloane Espresso Leaning Bookcase for a while. The gift card would really help getting two of them! I love the yarn ball accents! Something so simple looks so adorable!! I’d get stuff to decorate our new house…I love Crate and Barrel! So many things to love but those cookies are my favorite! I love that this theme is based on one of my favorite children’s books! I am planning my best friend’s baby shower and all of these details would fit perfectly with my ideas for her special day. I LOVE the star-topped cheesecake shooters! They look so cute and so scrumptious! My favorite detail is the cheesecake cups..love, love, LOVE them! Those cookies are adorable and it all comes together with those printables, which I absolutely love! Without a doubt I would use a Crate & Barrel gift card to get serveware for creative parties such as this. Love it!! Love the cookies and how closely they match everything. Super cute!! I love how the balls of yarn are added in–reminds me of the old lady in the rocking chair. As for the Gift Card to Crate & Barrel, I would use it towards a Kitchen Aid Mixer! I love the fact that the backdrop is a shower curtain- I would have never thought! Great Job!! i love love anything Vintage, so your vintage sweet shop baby was the BEST! I would try to find anything vintage looking from crate and barrel and revamp the babys room!!!!! I absolutely LOVE crate & Barrel! My husband’s birthday is coming up; and I have been wanting to construct a desert display out the the vases and nice serving dishes that they have there, so if I were to win the gift certificate, my little dream would come true! i’d use the crate and barrel gift card for fun textiles, cloth napkins, pillows, etc. I would use the $100 Crate and Barrel Gift Card to by organization items for all my scrapbook/party supplie stuff! As for Crate and Barrel I will use it to buy serving platters!! I love the cookies! I would put the gift certificate towards a new floor lamp for my living room. Oh gosh… I love C&B AND this party theme! I would probably put the money towards some new wine glasses and a skillet! Last month I hosted a “Very Hungry Caterpillar” themed, book baby shower. It was a HUGE hit, mostly because I stole many of the ideas from your site! Thank you!!! This party was so cute! I loved the dessert table. I’d use the gift card to FINALLY buy a flatware set to go with my thrifted china. With the holidays near, it would be awesome! So creative!!! Seeing one of my favorite books as a child brought to life by a party theme certainly made me smile! The Cookie Jar did a GREAT job with those cookies too!! I love the cookies that say “Hush” – I read this book to my daughter every night! SO ADORABLE! If I won the gift card, I would use it to buy several serving platters and dishes to use at my daughter’s upcoming FIRST birthday party! I would use the create and barrel card to continue to decorate our nursery. My husband lost his job when I was four months pregnant so we had to forgo a lot of things- including a real nursery. I love how the yarn was incorporated in the party. The swirly pops remind me of yarn. my favorite aspect is the cow jumping over the moon. so cute! I loved the colors! Especially the faux lamps” using pillar candlestick holders. Great theme!!! I would use the gift card for serveware or buffet pieces. I j’adore the lamps and cookies! Wow. So fun. The colors are amazing. So perfect for many occasions. Impressed. I need some new glassware! Or some platters. 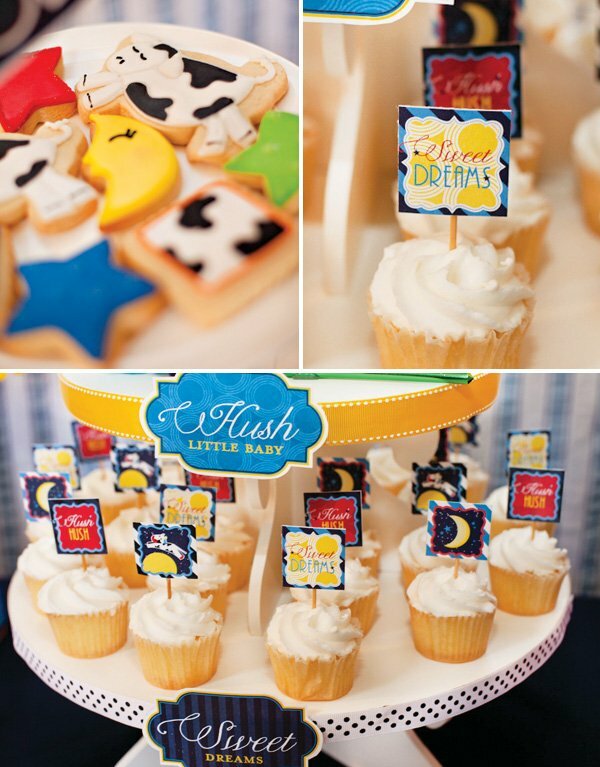 I LOVE the dessert table and the cow and moon details- too cute! I’d use the gift card towards my sister-in-law’s upcoming bridal shower! i love it all! especially love the tiered plate full of treats. that would be my choice at crate ‘n barrel! I love the sucker vase with the yarn balls on string. So cute! My nieces love this book! I would love to throw them a birthday party very similar to this, the attention to detail for this party is amazing!! 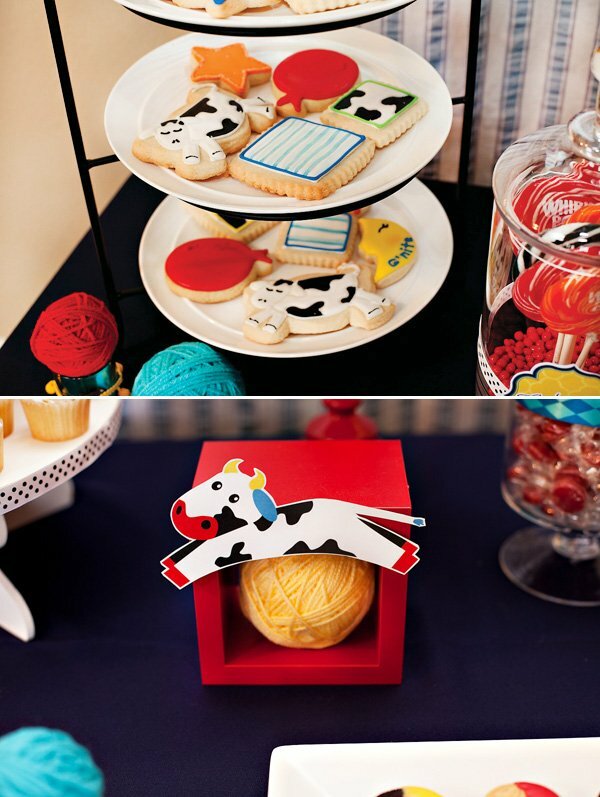 Loved the cow cookies…I would use the gift cards towards serving plates and dishes for my friend’s baby shower coming up soon! What an adorable idea for a baby shower! I absolutely love the colors and how the tables are decorated to look like beds! I would put the crate and barrel gift card toward some serving platters. The yarn details are just precious! I love the whirly pop display with the yarn balls incorporated with it. I am all about the candy tables right now…so creative. The beautiful sugar cookies are my favorite detail! I would use the gift card to start some early christmas shopping! I’d use the gift card to add to my collection of white serving pieces. I think I’d like the glue dots even more though, I use those buggers on everything! I adore this theme!! I love the cheesecake shooters– votive holders, what a great idea! What would I do with a Crate & Barrel gift card? Buy dishes and platters for entertaining because I can never have enough! I would definitely want to get some of the small glasses used. I am seeing them used with so many different party themes! I’m currently planning my son’s first birthday party and I’m going with a green and blue circles theme! 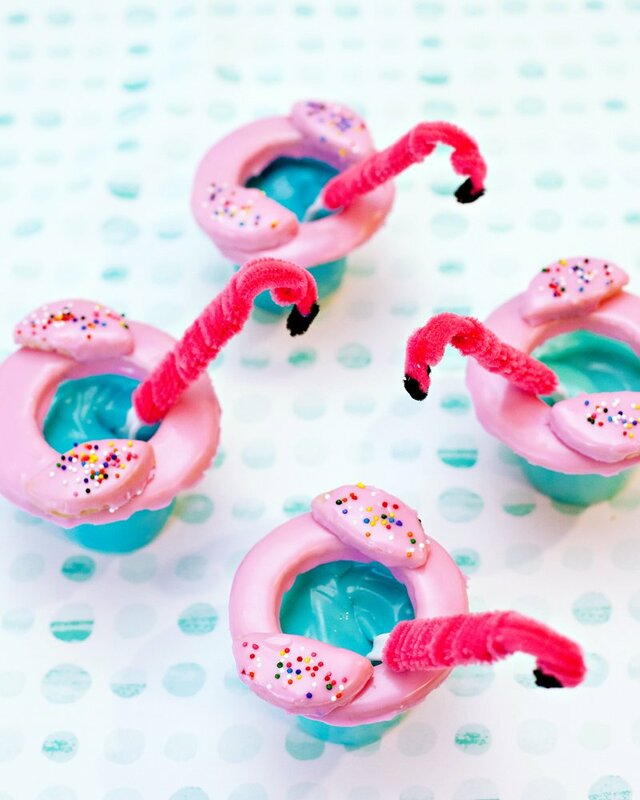 The cheesecake shooters are adorable and look very yummy! I love the moon yarn balls! Very cute! I would put a gift card towards some new glassware! 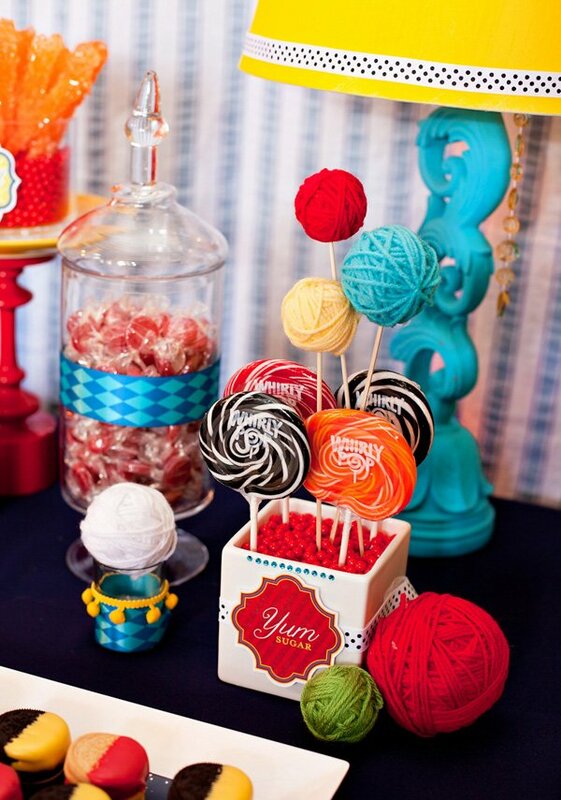 I love the yarn balls on the dessert table, so simple and colorful! One of my favorite books! I absolutely love this them! The details and colors bring out a playful theme. I love each detail of the place settings and main table. This theme makes will make all guets feel welcome! That has been all of our childrens favorite bedtime book….love how the printables came out and the cookies are great. I would use the C & B card for serving dishes/platters. I love the way that the red candies are used as a texture in so many different ways – whether it be on a plate or in a jar!! I would buy some kitchen items! I need some baking goods!!!! I LOVE, LOVE the colors in the THEME!!!! Great job!!!! Dishes and cups are things I can purchase to display beautiful food for parties!!! I loved the star shaped pastries in the cheesecake shooters! I love the mix n match dipped cookies! Not sure why I have never thought to use such a wide variety of chocolate/candy colors! I am planning a baby shower for a friend and will have to use your fantastic idea! Very visually appealing and I’m sure they are tasty too! Thanks!! precious! i love the cookies and the balls of yarn! love that the book and it’s story are so well incorporated into this shower! One thing I will probably be taking and using for other parties: cheesecake shooters and colored chocolate dipped oreos. (ok two) hmm my sweet tooth must be back. I would use the crate and barrel giftcard towards holiday decorating – soo excited to get started!! I would use the gift card towards purchasing wonderful Christmas decor for a holiday party! Using the tables to look like beds is such a cute idea! pick just one thing? almost impossible! overall i love how everything isn’t too matchy matchy, but the simliar textures, colors, elements etc used throughout pull it all together perfectly…. as for the C&B giftcard, I would most definitely use it to get some more serving pieces for entertaining… and maybe throwing a goodnight moon shower of my own someday! i love everything about this theme. I really like the idea of making the tables look like beds. So cute! Loved the detail of the cookies on the red candies, so cute and so creative. Great job!!! The crate and barrel gift card would quickly be used up on an Eco friendly couch. Or server ware and platters for parties made from inspiration! The cheesecake shooters and the cookies in the shape of elements from the book were my favorites!! I love the yarn balls, they are so adorable! Crate & Barrel is also a favorite of mine, so I know I would stock up on some new glasses. Awesome Blossom! thanks for the chance! I love the star-topped cheesecake shooters and the homemade lamps … ADORABLE! I love it all, but I think the cookies are so cute!! I LOVE the Goodnight Moon theme and the Sugar and Spice – you are amazing! I would use the crate and barrel towards redecorating our family room! I would definitely put the gift cards towards some servingware and perhaps some appetizer/dessert dishes. Thank you so much for this post. I want to let you know that I posted a link to your blog in CBH Digital Scrapbooking Freebies, under the Page 4 post on Sep. 08, 2011. Thanks again. This is one of my favorite children’s books! Love everything. But my heart beats a little faster whenever I see the bed-tables :D. You have an amazing gift! I really enjoy the lollipops in apothecary jars. The pops are so fun and the jars are so traditional and grown-up. I love the two together. If I were lucky enough to win, I would buy a collection of the Rimini and Savona pillows at C&B. I have been coveting them for some time now. I love that this is a neutral theme, based around a book, and very colorful! And, who doesn’t loive a cow print?! I I would use the gift card for new mixing bowls and spatulas. Maybe a throw pillow too! My fave party theme is a build your own cupcake party. I would buy nice white plates, small white bowls and a cake stand for displaying cupcakes and decorating supplies. Fun and cute! 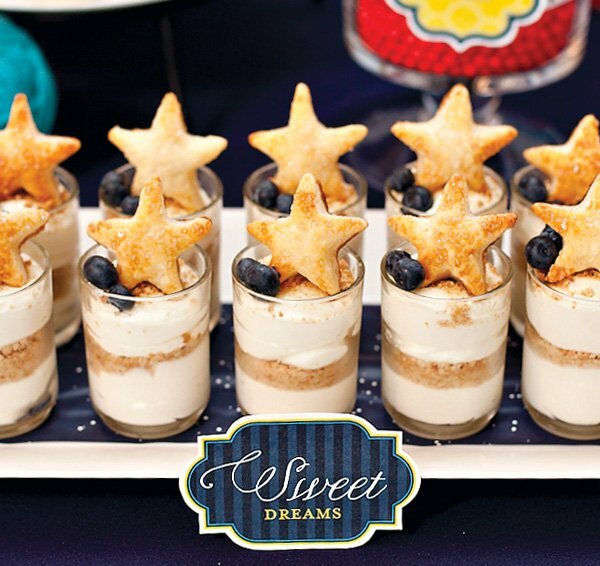 I love the Sweet Dreams desserts with the little star cookies! How cute is that!! I love the half dipped Oreos and the cute yarn balls. It’s all super cute. I love the cookies and also the table set a s a bed. And I’d have to put the gift card toward dishes. Mine current ones are looking rough. Love how you stacked the oreo’s with alternating colors – it’s beautiful and so simple! Love the sugar cookies & the bed sheets as table toppers!! I love the yarn detail. I love the desserts and cookies! So cute! I love the bright colors of everything, the theme is adorable! I would put the gift card towards the Le Creuset® Stainless Steel 9.5″ dia. Frypan as a gift for a boyfriend. He loves cooking, but he doesn’t have any nice cookware! Every element that best exemplified my most favoritest childhood book! C&B has the cutest spider cupcake holders! The details on those cookies are impeccable! I am OVER THE MOON excited about this theme! In fact, I am planning my sisters shower and I am using the idea that you have done for the tables as making them look like beds. I would defiantly give the Crate and Barrel gift card to my sister so she could purchase things for her future nursey (I’m an unselfish sister… I know :) )! I want to get my kids the lean on me study pillows!! Such a cute idea! I love the entire theme as that is my little boy’s favorite book! I’m about to move into a new house and have been eyeing a new set of dishes from Crate and Barrel for a while now to put in my new cabinets. I love all the bright colors..esp the hush cookies! i’m planning my little ones 1st birthday in October so i would use the gift card towards fun supplies for the party!!! I love all of the vibrant colors!! I love the Cheesecake shooters! Thanks for the chance! I recently got into crocheting so I was particularly fond of the yarn balls. I also enjoyed the cheesecake shooters. This was my favorite book growing up! Love the theme. I would use the gift card toward new decor and serve ware for our annual holiday party! I totally love all the bright yarn balls! 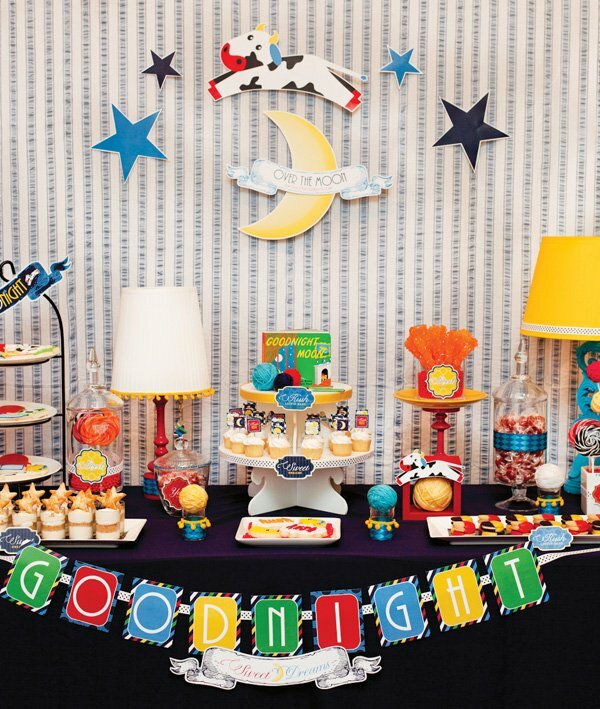 Love Goodnight Moon and all the details here! I would use the gift card toward entertaining pieces! I absolutely love the theme! Everything was so cute, especially the cookies and the star desserts! Very cute party! I would use the c&b gift card to buy some decorative accents for my home…a vase..a table runner! I love that you incorporated the good night moon book. That is an all time favorite at this house and I received it my very 1st baby shower. Books are an amazing thing for babies and kids as they grow. I would use the gift certificate to design an amazing birthday party for my son’s 3rd birthday. I love the pastry star-topped Cheesecake Shooters. 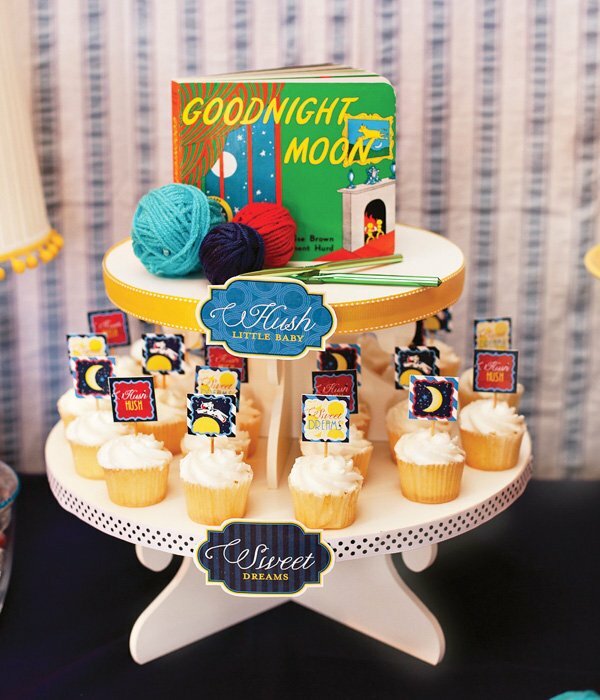 So cute, perfect for the Goodnight Moon theme! Love ALL your work! Your attention to detail and all the different color patterns you choose so well always fits together s nicely! And as far as Crate n’ Barrel and glue dots? Wow what an awesome prize! I love the sugar cookies. They are so cute!! I would use the gift card to help decorate my living room or buy some baking supplies. I would use it on serving dishes. I always loved their unique and fun serving dishes and being a Member Events coordinator I’m always looking for playful ways to add to decor/theme and food! I looooove the cheesecake shooters they are just to die for!!! If I would win the Crate & Barrel gift card i would us it to buy some seving plates that i want to use at my sons birthday party!!! I absolutely adore the yarn ball centerpieces! So cute! LOVE the cheese cake shooters and yarn balls. If I win the C&B gift card I will use it for serving wear for my sons upcoming party. I just love those little dessert shooters! And the color scheme for the whole party is so fun and fresh too! Great job! I’d LOVE a Crate and Barrel gift card, I’d use mine to buy more of their gorgeous white plates and platters! love the cheesecake shooters with cookie toppers! so beautiful and yummy looking! I love the shooters and the faux lamps! I would use the crate and barrel gift card for party platters and decorative vases. I love the book Goodnight Moon and what a fantastic idea for a theme. I am planning my son’s first birthday party and would use the winnings towards the party. My favorite theme is the Garden Party, I am doing my daughter’s 4th birthday this year as a garden theme, and your blog has given me so many ideas. Your ideas are so classical and amazing for little kids too. With the Crate & Barrel gift card I would redo my kitchen dishes, I have all the old stuff from when I got married and I need an upgrade badly. I love this party! It is so adorable!!! Every detail is amazing…I just love the idea of including lamps as part of the decor…the yarn makes it more precious…and those cookies are so stinkin’ cute!! Great book and great party…it serves the book justice! that is the cutest theme ever! What a clever idea! I loved the sugar cookies! all the decorations are incredible!! I love the cookies! They are super adorable! Especially the hush, hush ones! I’d put the gift card towards furniture. We need lots of it! I’d love the gift card to put toward some fun, new winter decor and placemats! I’d use the Crate & Barrel gift card to stock up on some more serving platters/dishes. LOVE that store! I love the little stars in the dessert shot glasses. How perfect! LOVE this post! Hmmm, probably more kitchen gadgets since I seem to have a weakness for them. LOL! I would use the CB giftcard to get ready to host my first Thanksgiving dinner! This is just over the moon! I would use it for all sorts of wonderful things for the house. After being married for 36 years, we could use some new stuff! I’d put it to use for my next big “ending-in-0” birthday party, which is coming up in four months! I love the Oreos and the “hush” cookies! This is one of my kiddo’s favorite books! If I won the gift card, I’d use it for serving platters! We just love a cow jumping over the moon… a wonderful post! I love the idea of using square vases/cubes for lollipops, or a ton of other things I can think of. How fun to fill it with sweets and treats you can enjoy after the party (or during). Fabulous party! I never get tired of seeing your yarn balls; you always incorporate them in such fun ways. Call me simply simplistic but I love the small detail by adding the colorful balls of yarn. I am currently 7 months pregnant and haven’t held my baby shower yet. I would love to use this theme for my new baby boy! I think a clever way for invitations would be to use those same eye catching colorful balls of yarn. I would have my guests unravel the ball to receive exciting baby shower details and information. The Crate & Barrel gift card would come in handy as us new parents could decorate and furnish our son’s nursery. The shower curtain is a fantastic idea! I love the use of a shower curtain for a backdrop and how you used your china cabinet. This is such a cute theme and you pulled it off so well. The yarn balls are adorable…I will be using this Idea for my son’s 1st birthday. I would use the crate and barrel gift certificate to purchase the lovely small, medium, and large Sweets Pedestals. i could def put the crate & barrel gift card to good use, on multiple things! dishes or a bedside table or picture frames or silverware…there’s so much great stuff at that store i can’t decide! I adore the cow…one of my kids all time favorite stories and this just celebrates the story so much… I would use the gc to pick out the perfect holiday table setting and get busy crafting some fun toppers and napkin accents using Glue Dots of course!!! thank you for the chance to win! I love the lamps and the cheesecake shooters! Those look SO yummy! If I won the gift certificate, I might save it to buy some xmas ornaments since Crate and Barrel always has great ones but then again…I do need some new wine glasses. Maybe I’ll get the wine glasses so I can enjoy putting up the Christmas tree that much more! I adore the primary colors used in this theme! So often you see pastel and muted colors for kid themes, but the primary colors gives it a childhood feeling that is amazing! I’m throwing my sister a baby shower, and the crate&barrel gift card would come in handy to buy all the cute dessert table pieces I’ve been drooling over! the oreo colors look so neat together! i’d use the c&b gift card for pillows! or lamps! or fun kitchen gadgets! i would put the crate and barrel gift card towards baking tools to help with my baby’s first birthday. my favorite at this over the moon party is all the tiny details and especially the star dessert. yummy! I love this theme! As a kindergarten teacher, this shower theme tugged at my heart! As for the C&B gift card, it would go STRAIGHT to organizational tools! Lord knows I need it! i really like the overall colors used, and how well they bring everything together! The cookies are also very impressive! I love the Goodnight moon theme and I especially enjoy free printable templates. So I would probably have to say the cupcake picks are my favorite. David and I were married 3 months ago today and now we are 2 months pregnant. We would put the Crate & Barrel gift certificate toward something for the baby. Probably some nice crib bedding. I love a great Dr. Seuss theme!!!! I love Goodnight Moon, it was my 4 year olds favorite book as a baby! My favorite details are the cow and moon cookies, they are just adorable! I also love that the colorful lamps were incorporated! I would put the gift card towards servewear for dinner parties! What a great idea! My mother read this book to all her children (4 of us) every night before bed, wait til she sees the ideas hear! She will flip, the woman is seriously obsesses with that story. I would use the gift card towards my sisters wedding (a pretty gift or something she may need)… and a pretty thing i may see and like, who knows what?! Wow. Great just great, so colorful. I just love everything about this. I would love to attend this party. I would use a crate and Barrel gift card to buy pillows and apothecary vases and jars. Thank you for a chance to win. oh my gosh when i seen this, i flipped over in my seat….’goodnite moon’ was my twins favorite book and we looked for the mouse on every page. we had it memorized from back to front, front to back! they’re 24 now and one is married, the other will be in oct. and plans on having children right away for ‘gramma’…this is the perfect shower for when i get that announcement…..oh please…! 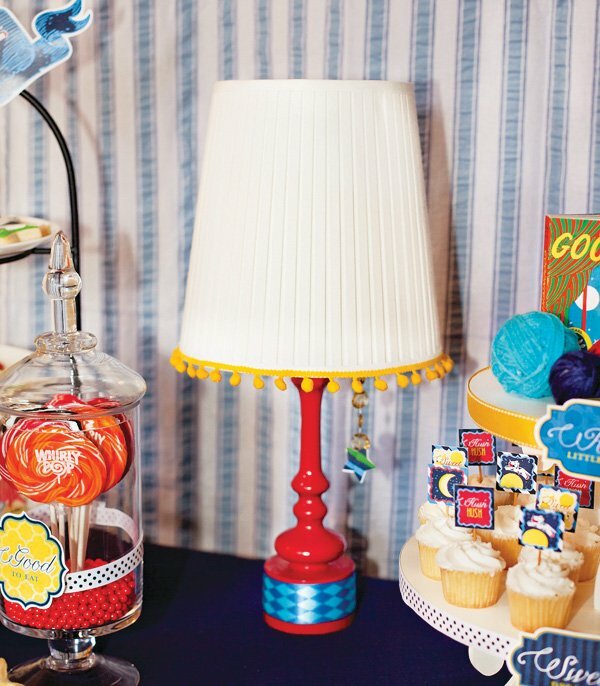 my favorite is the lamp/cupcakes with the book background and candy display. i totally ‘LOVE THIS’. thank you for the chance to win this! if i win, this is the shower i would throw! I love this shower! Great idea for either gender or for those who don’t want to know. I would use the crate & barrel card towards items to use for my mother’s 50th Birthday party. ;0) Thanks for a chance. I loved the cheesecake shooters not to mention the book displayed on the cake pedestal. As for how I would spend the Crate & Barrel gift card, I don’t think you can ever have too many white serving pieces. They are so versatile. I would use my C&B card to get their mixing bowls. thanks for the chance and what an adorable party! I would use my Crate & Barrel gift card toward The Marimekko Shop! I’d use my Crate and Barrel gift card for kitchen gadgets! Luv the cow jumping cookies, so cute!!! Id use the C&B gift card for furniture/storage pieces for my new craft room :-) Thanks for a chance to win! The details I love are the ones that are super simple to make or can be made with stuff around the house… like the dipped Oreos and the yarn balls. I mean, how easy is that?! Love it all! I really dig the stars on the cheesecake shooters. What a cute idea! It is all lovely though! I love the desserts and the homemade lamps. Very cute! My favorite part of this theme is all the bright, vibrant colors. I fell in love with the unique oreo cookies!! 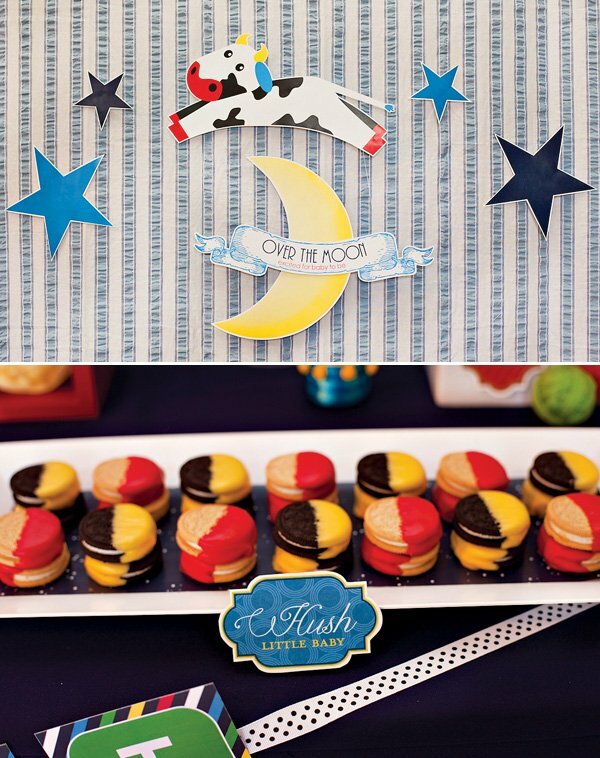 I love the cookies and the “Over the Moon” printable! I would use the gift card for tea cups and tablecloths for my sister-in-law’s baby shower. I’d put the gift card toward Marimekko stuff! So beautiful! Those lollies look amazing. I would use the Create&Barrel gift certificate to give a wonderful gift to my step mom. My bedroom is in need of an update! I will buy cute decor & put a little chic styles in there. I’m loving those faux-lamps…so smart to use all those different items to create them. I’d probably use the giftcard to get new Christmas decor! I would use the gift card to help add some decorative furnishings to my new house! Love all the different shaped cookies and their fun colors for this theme! The bright yarnballs seem to help tie so many of the elements together, I’m so in love with this! I would use the giftcard to furnish a nursery for the second baby to come! Oh my goodness! I found your site from a search and now I am a huge fan! I love your use of the Yarn Balls and the Lamp…. the most detailed ideas from the book! If I were blessed to win the Crate&Barrel GC to purchase fun entertainment items that my budget can’t afford. Oh I am so excited to have found your web site! I love those yarn balls – so cute! Great party!! I’m so excited to have found this site! My friend and I are planning a Good Night Moon baby shower right now! It’s hard to pick a favorite detail but I think your use of yarn here and there really stands out to me! I would use the GC to outfit my new home. I’m in desperate need of new pots/pans and servers! I LOVE the cookie decorations for this party. So creative and bright! Love the yarn balls. Would totally put the C&B giftcard to use on some decorations for my sister’s upcoming baby shower! Thanks for the giveaway! I love the star dessert parfaits–they’re so cute on their own, but they’re intolerably cute as part of the theme! I would have never thought of using Goodnight Moon as a theme and its an all time fave book of both my husband and I. This is a baby shower theme I will definitely use when we try for our second child. I’m planning a baby shower for my niece so I would use the gift certificate to buy decorating materials. thank you sooooo much for this adorable idea! And thank you for all the printables. You have made planning my sisters baby shower so much less stressful for me.